Wednesdays, of late, are exhausting days for me and Martin. He plays hooky from school. We start the morning by driving more than 50 miles to Wilton, Connecticut to visit Martin’s new homeopath and, if it’s an appointment week, his biomedical doctor. From Wilton, when our appointments are through, we get back in the car and drive more than 60 miles, back into New York State, across Westchester County and across the Tappen Zee Bridge and Rockland County, at last dropping into New Jersey at Ringwood, where Martin participates in hippotherapy. We eat lunch in the car: a sandwich for me, and Dr. Cow tree nut cheese with rice crackers for Martin. Then, while Martin spends an hour riding horses, I hike to a tiny farm and buy eggs. Around 3:15 pm Martin and I get back into the car to drive 45 miles home. (Are you keeping track of all these miles?) Although it is the shortest leg of our journey, this takes the longest, anywhere from 90 to 150 minutes, depending on traffic getting back into and through the City. Last Wednesday, on the morning drive to Wilton, I spent 20 minutes on the phone—hands-free Bluetooth, of course! I respect all traffic laws—trying to negotiate a good deal on the purchase of an infrared sauna. (More on that in a future post.) Martin was supposed to be practicing “being quiet while Mommy’s on the phone.” Instead, he grew increasingly agitated until he was sobbing while repeating, “You’re going to get off the phone! No more phone! You’re done with the phone.” I apologized to the sauna representative and finally, when I could barely hear him over Martin’s shrieking, aborted the call. Meltdown. The update for Daddy: At the office of the homeopath—“Miss Lauren,” as Martin calls her—is a pile of toys. I was talking with Lauren when Martin appeared with a toy mobile phone in this hand and said, “Mommy, I’ve got a phone.” I replied, “Oh? Would you please call Daddy and let him know we got here okay?” Without further prompting, Martin nodded, hit a few buttons on the toy phone, held it to his ear and said, “Hello, Adrian? But because we’re at Miss Lauren’s. Okay. ’Bye.” (Martin is in a phase wherein he calls Adrian by his first name instead of Daddy or Papá. “But because” is a verbal tic that Martin has.) Comprehending my request? Pretending? Following a direction? Yes, yes, and yes, thank you. When Martin and I arrived home from our three-state extravaganza last Wednesday—one day after I posted about how to be supportive—I found a package waiting for me. Inside was a card quoting those two lines. Under them, handwritten by the friend who sent this card, were the words: “Some of us need a whole box of cookies. Prayers to you and your family. Always.” Enclosed with the card? Yep. A box of cookies. I’ve been reading the Thinking Moms’ Revolution new book of essays. In one piece, the mother of a boy on the spectrum is asking, “Why did this happen to my baby? What did I do wrong? Is God mad at me?” Her mother, the boy’s grandmother, intervenes and points out that, if things had been different, she would not be asking, “Why did God give me a healthy child?”, so she doesn’t get to ask “Why?” now. Sage advice, right? What happened to my son—the Pitocin, the C-section, the antibiotics, the vaccines, whatever combination caused this autism—happened. But it doesn’t mean my life doesn’t rock steady. It doesn’t mean I don’t live in a world of blessings. 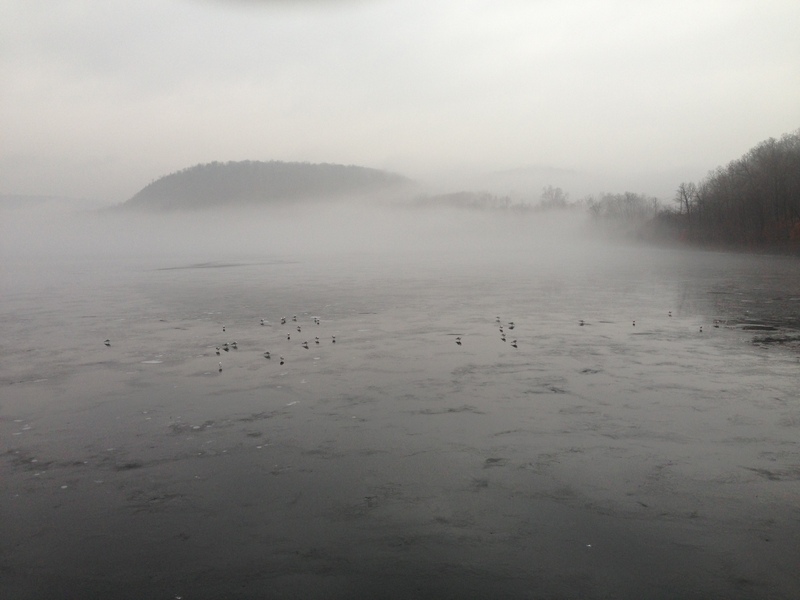 The Monksville Resevoir in Ringwood, New Jersey, where I hike while Martin rides horses. I took this picture with my iPhone a couple weeks ago. Life is good. Earlier this week, Martin entered the apartment with me and discovered that I’d left a box on the kitchen counter. It was nothing special, just an Internet purchase I had not opened since it arrived that morning. The question was spot-on. It was relevant, directed (including eye contact), and succinct. He even got the intonation right. Not impressed? Get a kid with autism. Martin’s verbal skills are outstanding these past couple weeks. Like any parent of a recovering child, I’m digging through my notes, supplementation charts, lists of interventions, and so forth, trying to pinpoint what underlies the improvement. As usual, I have no idea. Still, I love it when something’s going right. Two families we know with boys on the spectrum have made repeated trips to Disney World in Orlando. All four parents report hassle-free, autism-friendly vacations: luggage and organic groceries delivered directly to your villa (“Check a suitcase at LaGuardia. It shows up in your room!”); passes to skip the long lines for attractions; and a mix of exciting activities and, outside the main park, calmer spaces. Adrian and I are considering taking Martin to Disneyworld. For me at least, I don’t want to go because I love Snow White or think Martin will be psyched for a magical castle. I want to do a Disney vacation with Martin because a Disney vacation is what American kids do. Right? Martin’s childhood, so far, has bypassed the standard markers. He attends a special school, he swallows a million pills and oils, he spends his afternoons in therapy, his friends have diagnoses, and he can’t eat—well, he’s not allowed to eat candy, or refined sugar, or McDonald’s, or processed food, or pizza, or anything much else I see in the hands of kids. But he can go to Disney. Despite the endorsement of other ASD families, we’ve been worried about whether Disneyworld really makes sense. It’s crowded. Noisy. Flashy. Crushing. Maybe the theme park would just overwhelm Martin. Back in November, Superstorm Sandy led to an unplanned week without school here in New York City. In compensation, Martin’s school lost the scheduled February break but tacked two extra days onto the Easter break, and Martin ended up with eleven consecutive days without class. Martin and I utilized this vacation bonanza for his first-ever West Coast visit, to my brother Rudy and his wife in Laguna Beach. Rudy came up with a great idea: As we were in Southern California anyway, why not take Martin to Disneyland? It could be like a trial run, a few hours at the original theme park that now seems like a junior version of the Orlando behemoth. I jumped at the suggestion. On a Thursday morning Rudy and I collected Martin, his stuffed elephant, his afternoon supplements, and his special food and drove to Anaheim. We were headed, as we put it for Martin, to Mickey’s house. I am pleased to report success. The ticket agent gave me and Rudy and Martin big “I’m celebrating!” buttons; Martin insisted on pinning two buttons to his loose T-shirt, where they dangled all day. Inside the park he selected a fuzzy blue Sorcerer’s Apprentice hat (with mouse ears) to buy, and although it was 80 degrees and the thing was like a quilt wrapped around his head, he wore that all day, too. We stopped by guest relations. I explained that my son has autism and gave a little report on his strengths and weaknesses. The representative gave us an “accommodations” ticket allowing all three of us to use the special-entry lines, which are much shorter than the regular lines. And from there, we hit the rides. With all the bustle, Martin was more distracted than usual as he wandered through the crowds. Nevertheless, he beamed. He rode “it’s a small world,” where he was scared to be in a boat but liked the children singing and the floating moon; flying Dumbo elephants, where Rudy showed him how to use the altitude lever; the Jungle Cruise, where the boat operator warned me before he fired a fake gun; and the carousel, which he handled like a professional based on weekends of carousel riding in Brooklyn. His favorite attractions were musical performances and the thrice-climbed Tarzan’s Treehouse. Martin even survived the Roger Rabbit ride. Rudy and I assumed that because the Roger Rabbit thing was in Toontown, it would be mild. Holy cow, was that a mistake. It turned out to be a spinning car whipping us in circles through strobe lights, screaming, and demonic-looking animated characters. I was scared. Martin clung to me but didn’t cry. We stayed in the park for seven hours. Seven hours! Martin got to bed late that night and slept well. Two days later, on Saturday, Adrian surprised us all by flying into LAX. He’d ended up in Northern California on business and was able to sneak away for the weekend. Martin and I picked him up at the airport and then headed directly back to Disneyland for another seven-hour visit. “Yes!” Martin said. He smiled. “No!” Martin said. He still smiled. I think he was exhausted. Everything in moderation. I’m sure that, by the time I manage to put together a family trip to Orlando, he’ll be ready again. 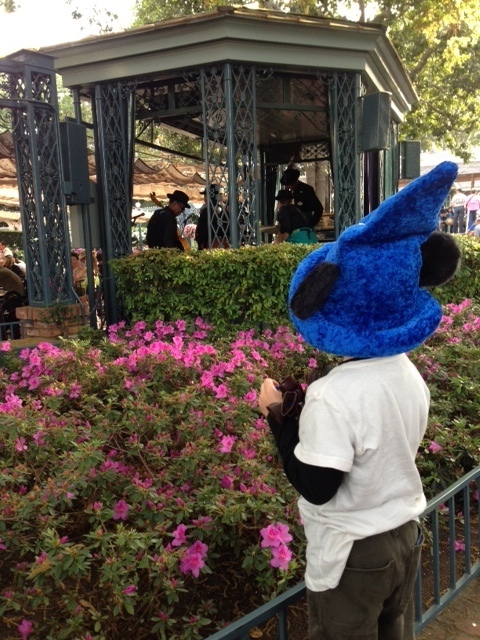 In his Sorcerer’s Apprentice hat, Martin enjoys music from the “New Orleans” bandshell. The drummer threw Martin some beads. 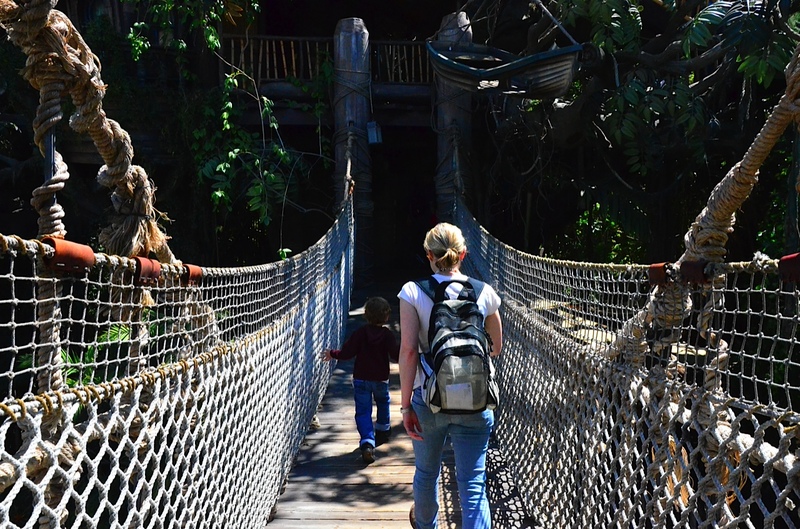 During the Saturday (second) visit to Disneyland, Martin and I headed once again into Tarzan’s Treehouse. 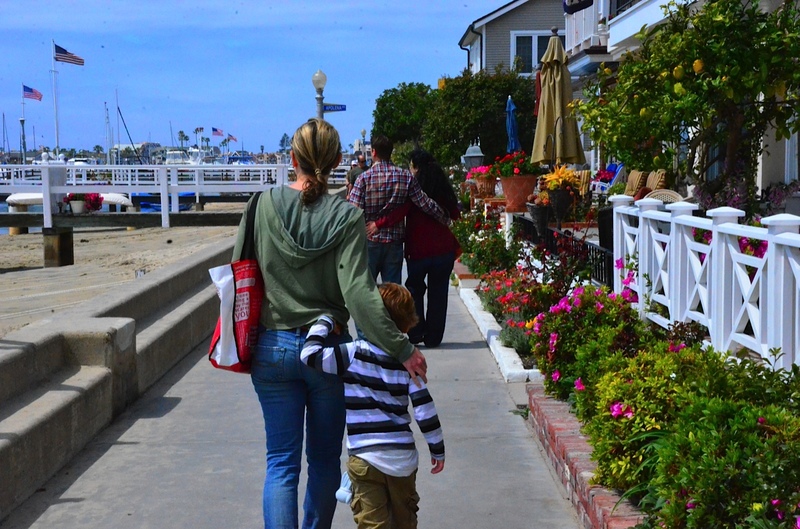 Back outside Disneyland, Martin and I strolled Balboa Island with Rudy and his wife (in front of us). I think we’re imitating them. Martin enjoyed the views of Southern California. 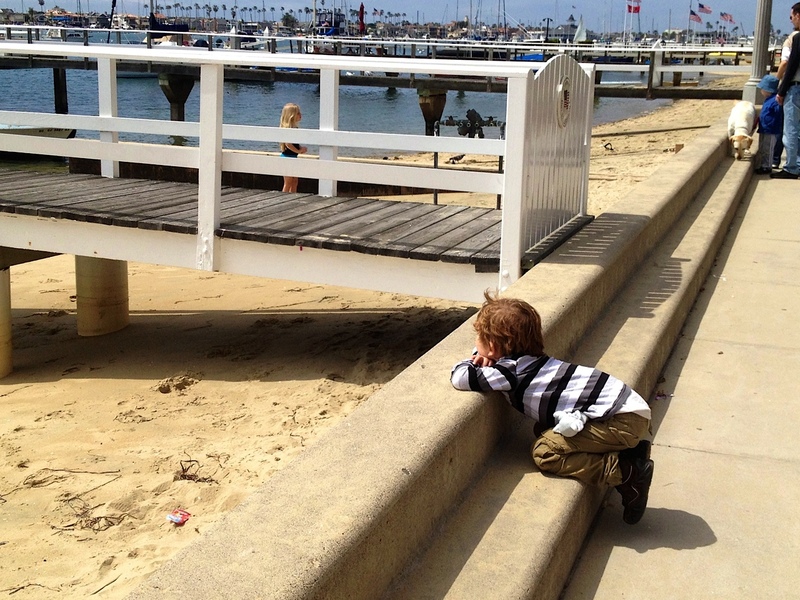 This shot was taken on Balboa Island also. 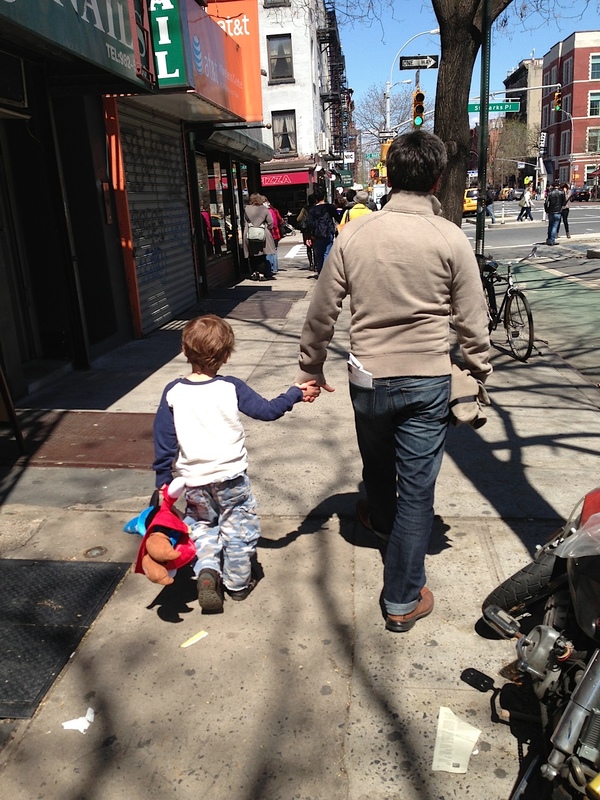 After we returned to New York, Martin enjoyed carrying his Mickey Mouse doll, as here on the Lower East Side with Adrian. Want to know what kills me? You can imagine where that goes. More than two years into our recovery journey, Martin still engages in many frustrating behaviors. He loses attention, dawdles, wanders. His low muscle tone causes him to fall out of chairs and also to sit down anywhere—in a crowded grocery check-out lane, on the floor in the Starbucks bathroom, astride the playground rope ladder so other children cannot pass. When his mind works faster than his words, which happens often, he whines. Of all the behaviors, perseveration is the worst for me. Martin repeats constantly. He talks when no one is listening. He chats merrily regardless of others trying to speak. It’s only a fantasy, of course. If I go to lunch with a friend who can’t let tardiness go, I listen patiently until the discussion finally runs its course. When Martin carries on about nothing, I indulge him, or I say, “I don’t want to talk about that,” or I bite my tongue. And then I kiss him, over and over and over again. That’s my own game of repetition, to remind us both that Martin is my everything.